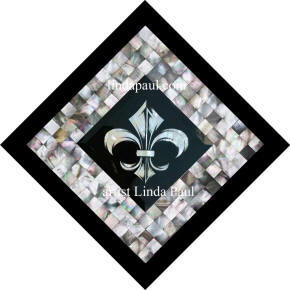 Mother of pearl tile mosaic medallion with fleur de lis tile center by artist Linda Paul. New from artist Linda Paul. 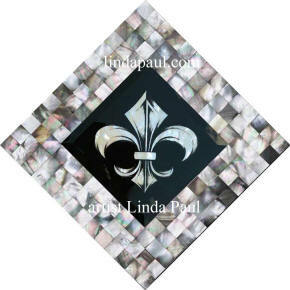 Mother of pearl mosaic tile backsplash medallions with hand-painted glass tile center of fleur de lis. 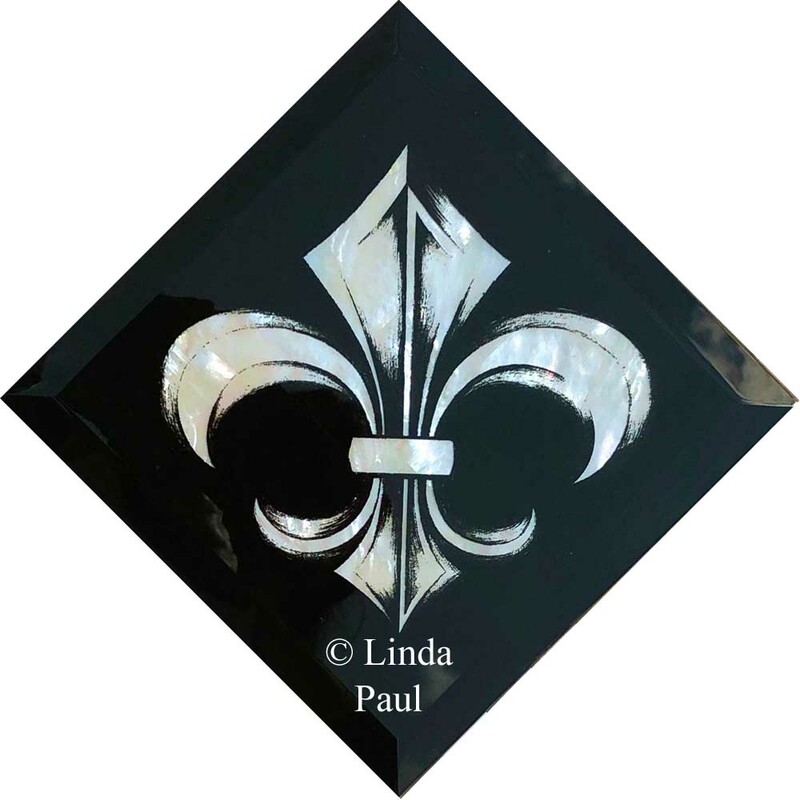 Buy for direct install between tiles or use as a one piece removable backsplash or wall art, framed or unframed medallion. 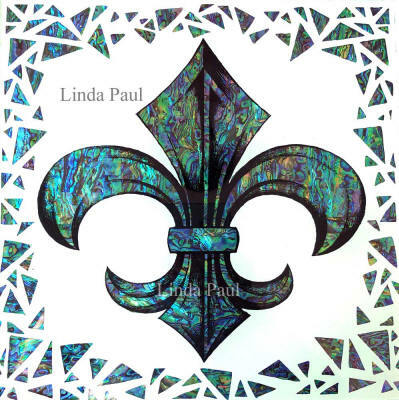 These original works of art by Linda Paul are completely hand-made. 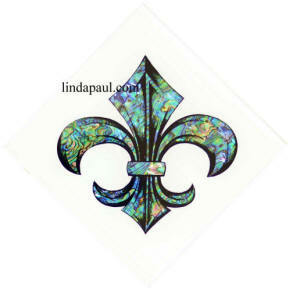 The center glass tile is mother of pearl shell and and paint on the back of the glass. 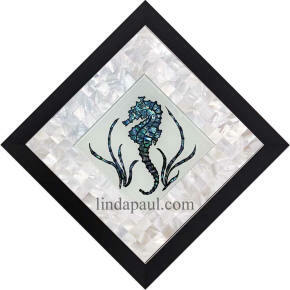 Then the glass tile and the mosaics are mounted onto a 1/8" board . 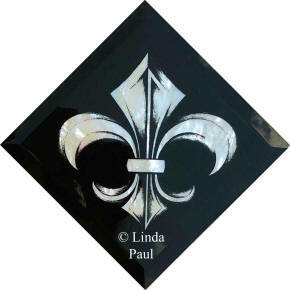 You can buy it unframed or framed in a 1-1/4" wide black metal frame. 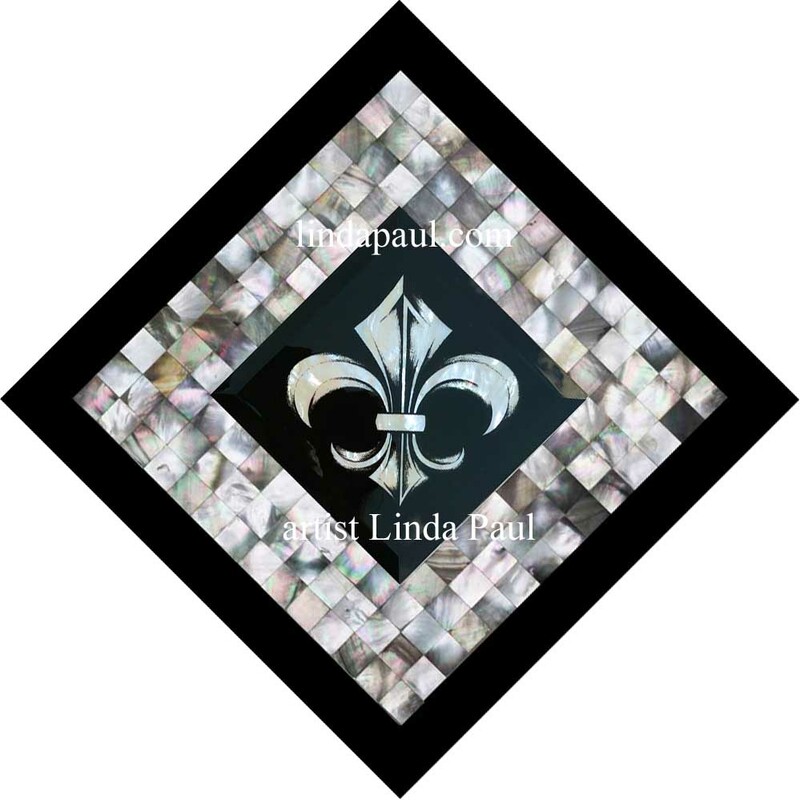 You can install it directly into a backsplash between other tiles hang it as as one piece tile art on your backsplash or anywhere in your home. 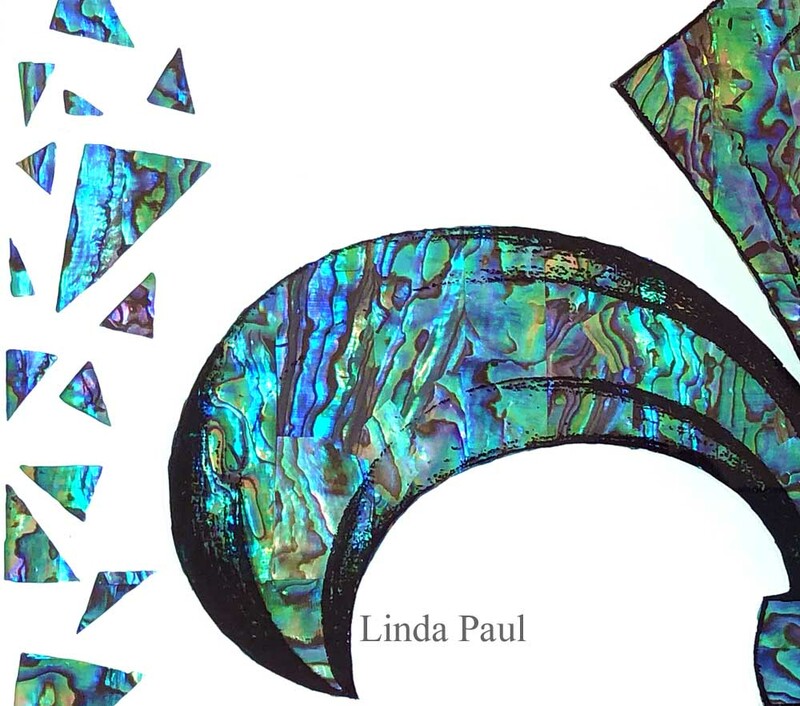 The shells and mosaics are amazingly iridescent and change color with the light. They have to be seen in person to be truly appreciated. 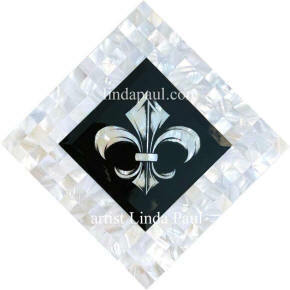 UNFRAMED Fleur de lis and white mother of pearl mosaic. 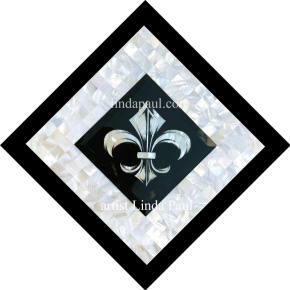 Please contact us to customize medallion with different color shell . 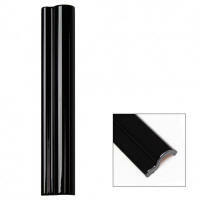 You can buy black ceramic tile border below. 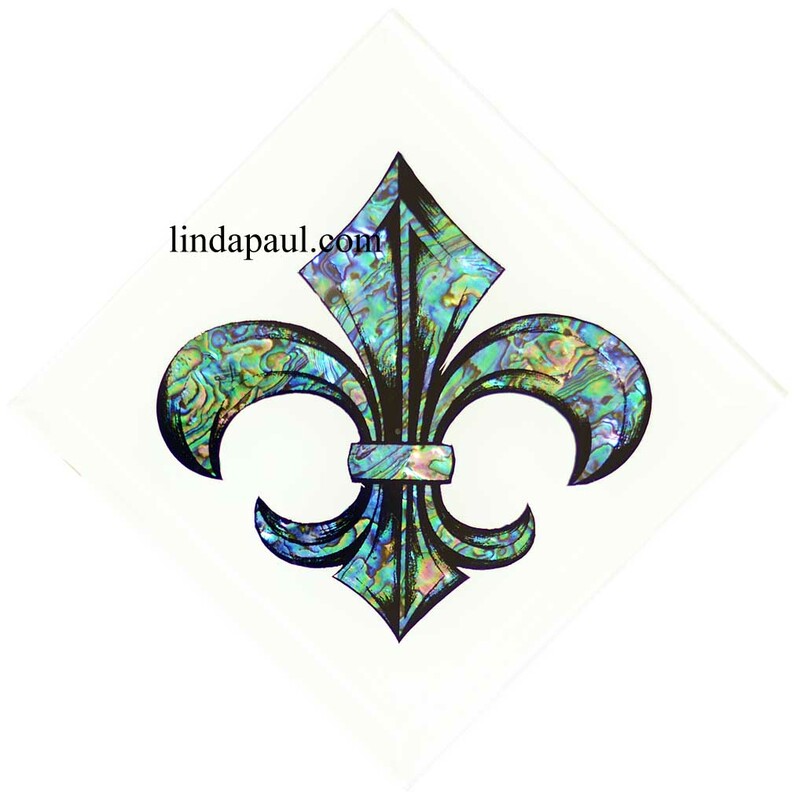 Gorgeous Fleur de Lys hand-made glass tile with natural paua shell and mosaic design border . 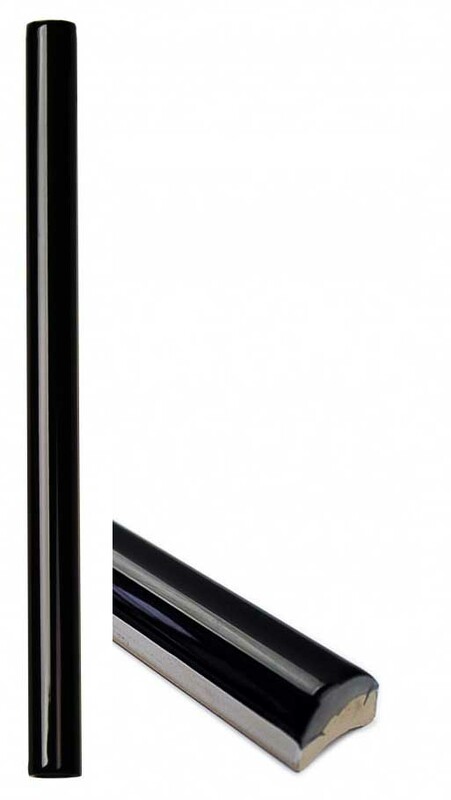 Horizontal Orientation. 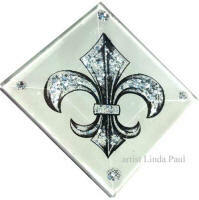 Each side of the glass measures 12". 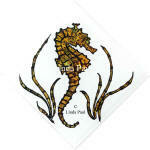 We have 1 horizontal one that can ship out in about 5 days. It takes 8 of these to fit the 10" x 10" unframed mosaic medallions because of the 45 degree mitre you will have to cut in the corners. 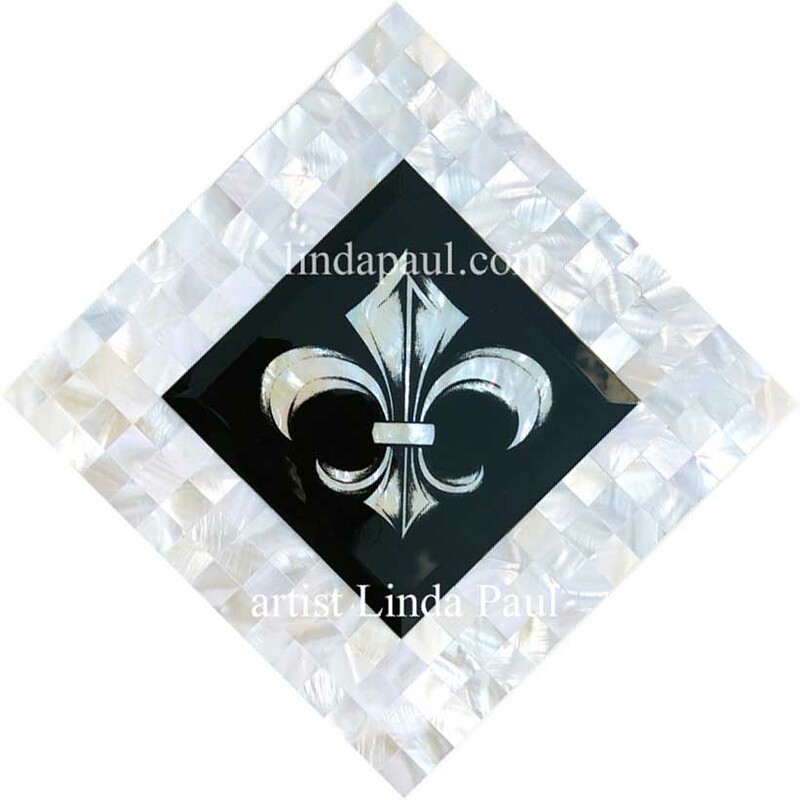 It takes just 4 of these to fit the 10" x 10" unframed mosaic medallions. You will need to cut a 45" mitre at the corners. 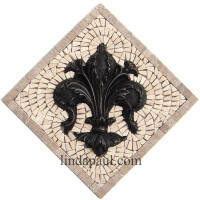 Shows tiles from the side. There is a board on the back of the glass. There is a layer of clear silicone seal between the glass and the board as well as around the side perimeter of the tile (not shown here). 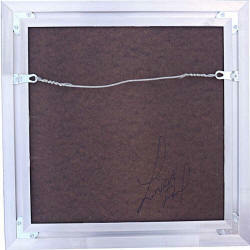 Shows the back of the metal frame (of a horizontal version). 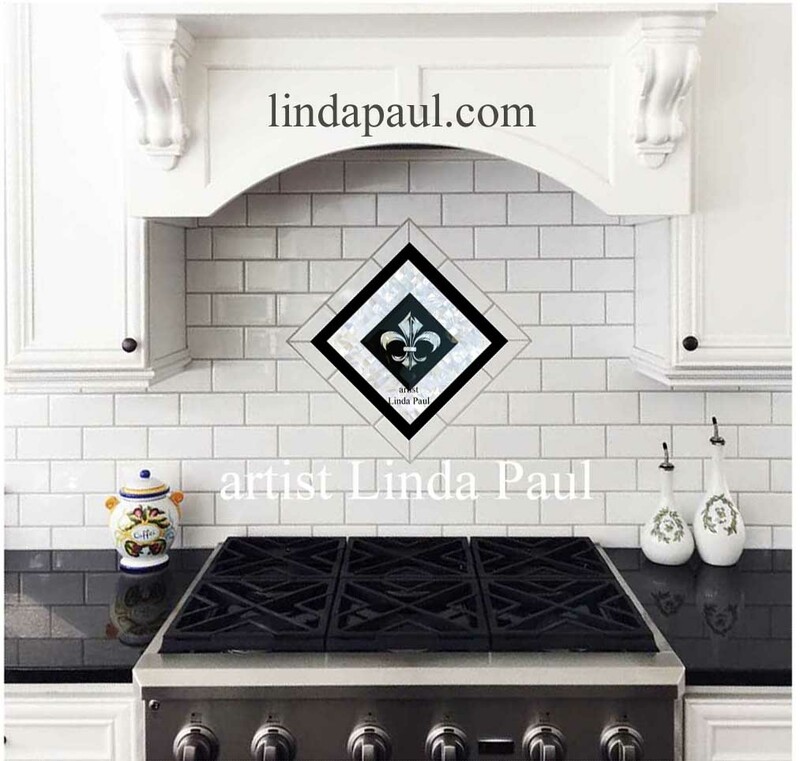 The original artwork and mosaic tile protected by a 1/8" thick board. 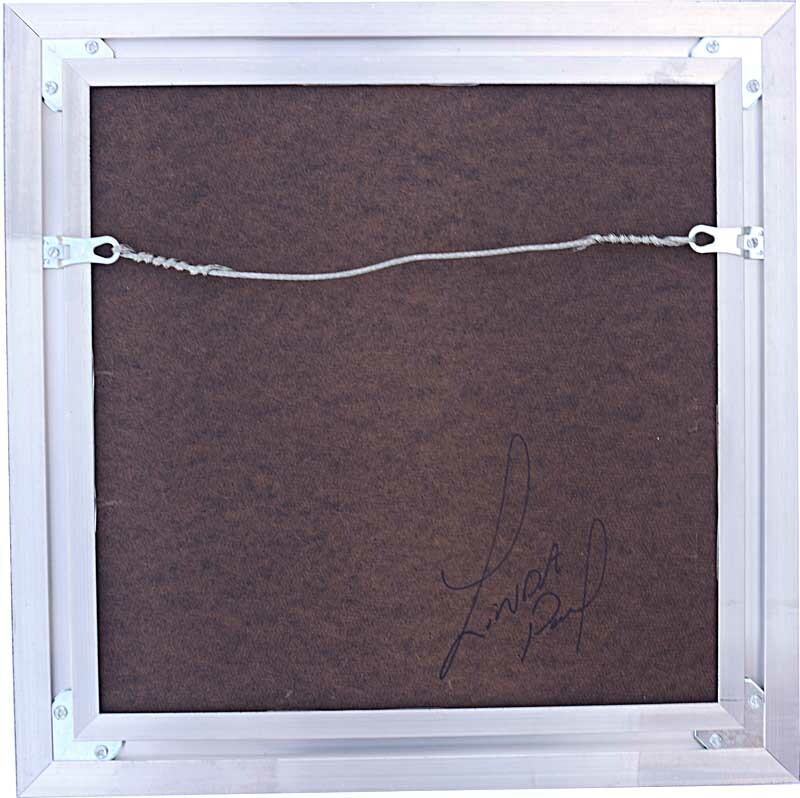 You can add or remove the hanging hardware with the 2 screws of the strap hangars (that contain the wire) and the strap hangars will just slide out or back in. 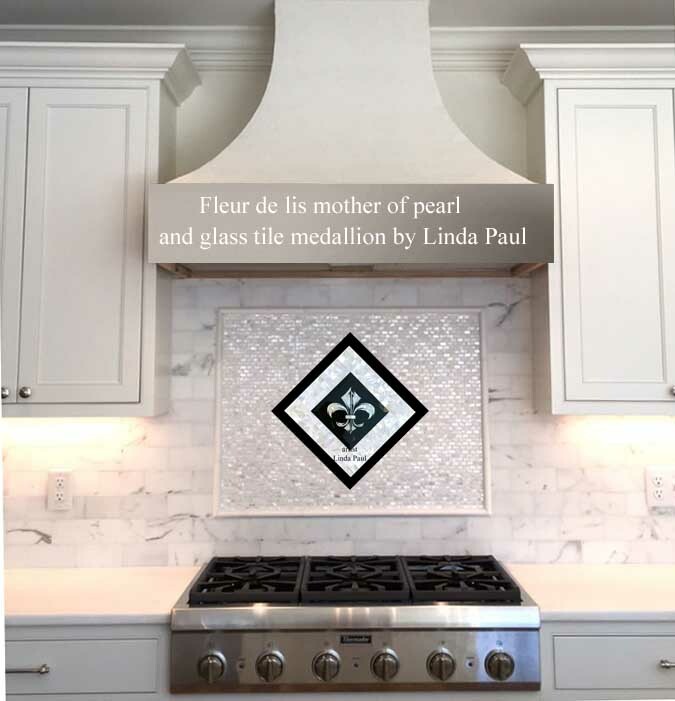 6" x 6" , 4x4" and 2x2" glass tiles install Between Other Tiles: The glass itself is 3/16" thick in the center and 1/8" at the edges (because of the bevel ). 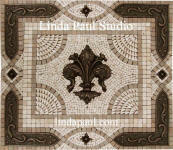 We add a 1/8" board to the back so the entire piece is 1/4" thick and can be installed in between your other tiles. The mother of pearl mosaic pieces are 1/4" to 3/8" thick which includes the board that we add to the back. 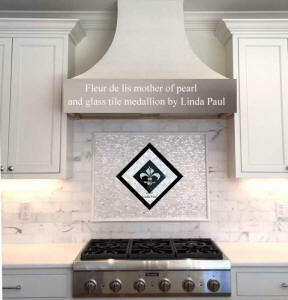 The tiles install just like our regular ceramic or marble tile using a premixed ceramic tile adhesive such as Omnigrip or Laticrete 254 platinum.